I went to DCHS Tuesday last week hiking by way of the Bradford Ridge Trail part of the way in, and all of the way out. Going in I went on the Bradford Ridge Trail for about 20 minutes, then went cross country north easterly and connected with the PCT upstream from DCHS. I then went in a downstream direction on the PCT and when I passed the Indian Camp area there was a group of cows down below me right next to the creek. I told the USFS and the BLM about the errant cattle the next day. Mr Stone's cows are out of their allotment once again. The BLM person who deals with grazing allotments said the Round Mountain allotment ( where Mr Stones cattle are supposed to stay ) goes through the end of March, after that the cattle should be out of there till they start up this grazing allotment in the fall of next year. The USFS are not happy about the cattle getting into the USFS areas, and especially down to the creek. The fences are broken, and the cattle will just keep going down there. Stone now owns the old Paradise Ranch property on the lower elevations of the Bowen Ranch Rd, the place with the white pipe fencing running next to the rd. When I got to DCHS the creek was still running high and most people were wading across it chest to neck high. 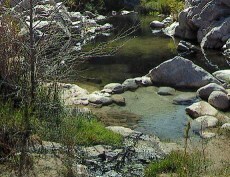 I didn't have to take that cold plunge ( twice like the others ) since the Bradford ridge trail takes you to the hotpools side of the creek. Talked to Robert who did the new cement work last year on the Arizona pool. There is another big hole in the side of that pool now. We chatted for a time in the sun and cool breeze on DCHS Del Mar :-) Had a nice soak in the Womb. Did the hike from DCHS back to my truck on HWY 173 in 64 minutes. The Bradford Ridge trail is in good condition. It was a nice cool day for a hike with windy conditions and some clouds late in the day.